Johanna Lundy is the principal Horn of the Tucson Symphony, a position she has held since 2006. Passionate about getting the world interested in classical music, she is especially interested in contemporary music, celebrating living composers and bringing new works to audiences in fun and interactive settings. She has performed with orchestras across the United States, including The Florida Orchestra, Phoenix Symphony, Albany Symphony, New Hampshire Symphony, New Mexico Philharmonic, Des Moines Metro Opera Orchestra and True Concord. Known equally well as a soloist and recitalist, Lundy has appeared as a guest artist with the Aspen Music Festival, Grand Canyon Music Festival, Virginia Arts Festival, St. Andrew’s Bach Society, Tucson Symphony, Sierra Vista Symphony, and the Downtown Chamber Series in Phoenix among others. She has received critical acclaim for her “robust sound” and her “breathtaking” and “extraordinary” performances. 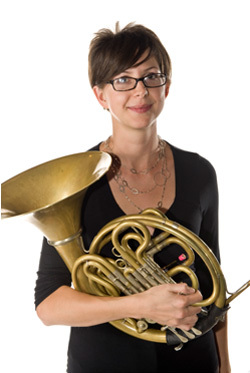 A dedicated teacher, Ms. Lundy is the newly appointed Assistant Professor of Horn at the Fred Fox School of Music. Her former students have gone on to varied careers in music, including positions with professional orchestras and other ensembles. In 2010, she was named one of Tucson’s 40 under 40 by the Arizona Daily Star and in 2017, she received an Artist Research and Development Grant from the Arizona Commission on the Arts. Ms. Lundy released her debut solo album this fall, “Canyon Songs,” which features music inspired by art, nature, and devotion. She received her Bachelor’s degree from Oberlin Conservatory and her Master’s from the New England Conservatory. You can find out more, including original short films with solo horn accompaniment at www.tucsonhorn.com. When I was in 7th grade. I thought it looked pretty. No, my dad is a geologist; my mom is a math teacher. What makes the French horn special? The sound is unlike any other. It is also the longest instrument of all the brasses (except for the tuba) and most extreme – it starts the smallest and ends the biggest (again, except for the tuba, which ends bigger). This is what gives it such a special sound. Interesting personal fact: I know karate.